Natalie Clarke, a keen Melbourne-based kitesurfer, is ready to attempt the first solo unassisted crossing of Bass Straight kitesurfing. 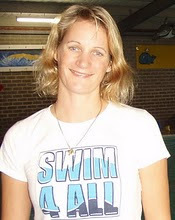 Natalie has been training hard for this feat, and is also fund raising for the Swim 4 All Foundation. The attempt is now waiting for the right wind conditions. Fingers crossed that the wind god smiles and that Natalie makes it. Sean, a kitesurfing buddy who frequents South Melbourne beach and environs, rescued a drowning woman using his kitesurfing gear. The woman, who had apparently fallen oft a jet ski, was floating face down when Sean kitesurfed out to her. He was able to drag her in to shore using the kite controlled by one arm, and his other arm around the woman. Well done Sean. Hi, my name is Stuart Webb - I've shared some great adventures with Peter over the last year or so, and thought I'd share some tips that have helped me out. I've been kiting for about 6 years and last week I had a bit of a disaster. One of the pulleys on my Switchblade (IDS 10m) broke on one of the leading edge lines. The wind was about 25 knots and the kite just kept on picking up and spinning around. It took me some time to figure out which line had been broken, by which time the lines had become very tangled and I was unsure as to the best way to handle the situation. Get as much depower as possible. This will typically involve taking all the tension out of the back two brake lines. If you have a switchblade, use the absolute depower. Depowering typically involves letting go of your bar or activating a depower mechanism. You must swim up to the bar to regain it. To be sure that tension remains out of the back brake lines, wind in the middle leading edge lines onto the bar. Remove the board from your feet and secure it to your body to leave you free in the water. You can use your safety leash by detaching it, threading it through your board and reattaching. Or carry another leash. This step could be done prior to step 1 depending upon personal preference. Wind in all remaining lines onto your bar, exactly as if you are packing up at the end of a session. This will take you up to the kite. In my instance, I have a 2009 Cabrinha Switchblade IDS. The pulley broke. Apparently these pulleys have known issues - so my advice is to replace all your pulleys with the warranty Cabrinha pulley replacement. Apparently for some extra cash you can replace these pulleys with an Aluminium slider (which comes as standard with the 2010 model) - reducing the chance of failure and wear on the lines. 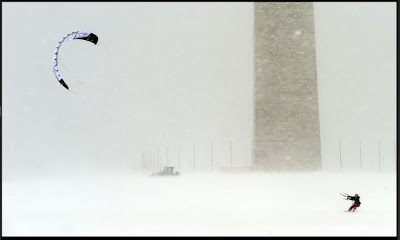 From Keith Edwards, my neighbour who is living near Washington D.C. - here's a novel way of enjoying 40+ inches of snow in DC, with the Washington monument in the background. Back in Australia, a friend of Keith's had a kitemare at Merimbula. He got tangled in his kite lines when body dragging and was hurt badly after being "tea bagged" repeatedly. He was rescued eventually by a tourist boat in the vicinity. Have enough lessons to learn kite control and safety drills. Five is a realistic minimum. 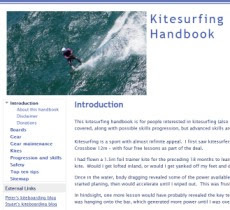 Practice your safety drills - such as releasing your kite completely. Carefully check your set up before heading out. Carry a safety knife and cut your lines if you get tangled in them, don't try to "sort it out" unless the kite is safely on the beach. if you get tangled, land the kite and re rig the lines before flying it again. If in doubt, release your kite without delay. Labels: kitemare, merimbula, snow kiting, washington D.C.